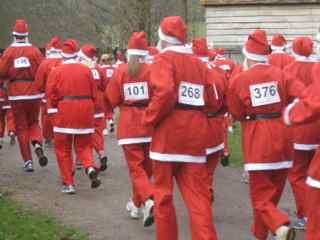 Basically it is a simple fun run put on some time over the Christmas holidays where everyone dresses up as Santa Claus / Father Christmas. The great advantage is that because of the dressing up element it is not too serious and will attract many more people than a normal more sporty event. This all depends. Not many Santa Runs are longer than 5km. Many are much shorter to attract the "not so athletic" amongst us. Whatever the location you can of course do several laps to make up the distance. How do they raise money? Commercial sponsorship - Would a local company be willing to sponsor the entire event in return for their name being associated with it. ie the Bensons Beds Santa Run for St Richard's Hospice. This sort of company support usually would cover the cost of staging the event. It might be that they could also help with equipment and logistics. Participants for the run itself might then be mostly from that company as a way of getting their staff involved in a community event. It might be however that the company particularly want it to be an event open to others and are more interested in simple promotion of their brand or company. Individual sponsorship - This is really the main way to make money. Every runner is responsible for collecting as much sponsorship money as possible. These days this is usually for taking part in the whole event rather than an amount per mile. You will need to provide a sponsorship form in advance to all participants. As with all sponsorship you can have simple competitions to incentivise runners. ie prizes for people who raise the most etc. Within sports clubs you might be able to play off one team against another or in offices one department against another to engender some rivalry to encourage greater efforts around sponsorship. 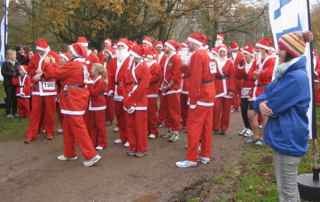 How do I organise a Santa Run? 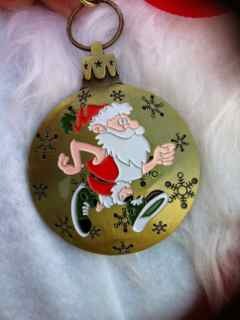 Santa Runs can be enormous affairs and in some towns and cities they can attract several thousand participants. Others are much smaller with between 50 and 250 participants. If you think your organisation or group is too small to put on a run you can always partner with others. In this way 2 local churches could run between parishes or 2 or 3 local charities take over the local park for the afternoon. The course - First and foremost needs to be safe for both runners and spectators. You also need a good place for start and finish lines. Think about toilets and parking. Think whether you need permission. You might need to talk to the local authority. Don't be put off by that you might find that they have some helpful suggestions. Sponsor forms - Really important if you want people to raise money. Make your blank forms profesional but friendly. Keep it simple. All you really need is details of the event then a blank table with name, address and amount sponsored. If you are a registered charity you should include your registration number. You should always include a contact address and telephone number for your organisation. Think how you will get these out to your runners. This might be by printing and physically handing them out or by electronic registration and then download to runners via computer. These days too it is very easy to set up a page for online donations via sites like JustGiving and many people prefer these as it makes things click easy and no money handling for competitors. Signing up - You really do need to get people to register to take part in advance although always be willing to take extras on the day. Ensure that you record the names and contact details of all those who agree to take part. You can register people manually at other events or electronically via a website. Some organisations charge a registration fee to take part to help cover costs. This should not deter committed Santas and ensures that people take it seriously and are less likely to drop out. Registration - On the day make sure that you register all those taking part and check their names against you master list. You should give them a number. When they have completed the course you should check them back in. It is important to do these things properly and professionally. 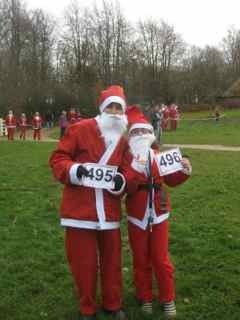 Although a Santa Run is lots of fun it is also about charity and raising money. Runners too will want to know that there efforts are appreciated and the event is being well managed. Collecting the money - Make sure that you have clear dates set for the return of any sponsorship money collected. Its really important to engender a sense of fun at the event. 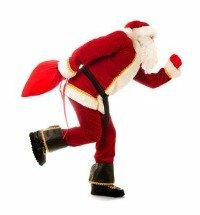 A Santa Workout in advance of the run is a great way to achieve this. 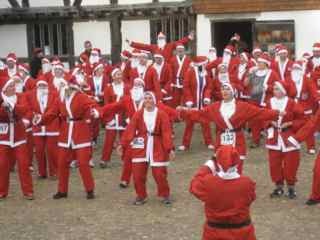 Can you persuade a local aerobics teacher to come and put your Santa's through their paces. At the very least make sure you get all the Santas together for a "Team Photo". 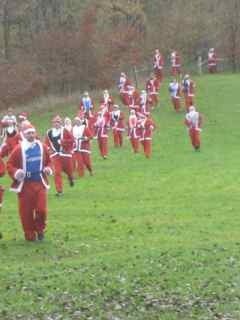 As well as being great fundraisers Santa Runs are a brilliant way of attracting publicity to your organisation. This might be to attract support for your cause or more volunteers for your organisation. There are a number of variations you could do on this basic idea just to be a little bit different. Santa Relay - Carrying piles of presents? It may take a couple of years to get your Santa Run established but do stick with it. They really are great fun, good money makers and can become a regular part of the fundraising calendar in your town. 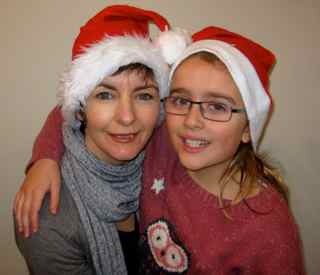 All the pictures on this page were taken at the Santa Run organised by St Wilfrid's Hospice in Chichester (UK). The event took place at the Weald and Downland Museum in Singleton.